How much did you love Descendants, the Disney Channel teen musical where a group of magical misfits were sent to a high school for preppy elites? Well, now you’ve got Zombies, an all-new Disney Channel teen musical where a group of magical misfits are sent to a high school for preppy elites! Only this time, there’s the ever-present threat of mass murder. The first trailer for Disney Channel’s latest foray into Monsters High knock-off dolls has been unveiled by Entertainment Weekly. The live-action musical takes place after a toxic spill turns a bunch of Seabrook’s quiet citizens into flesh-eating zombies. One of the undead, named Zed (heh-heh I get it), explains how they’re able to keep their body-devouring tendencies at bay with the help of some harmless shock therapy. 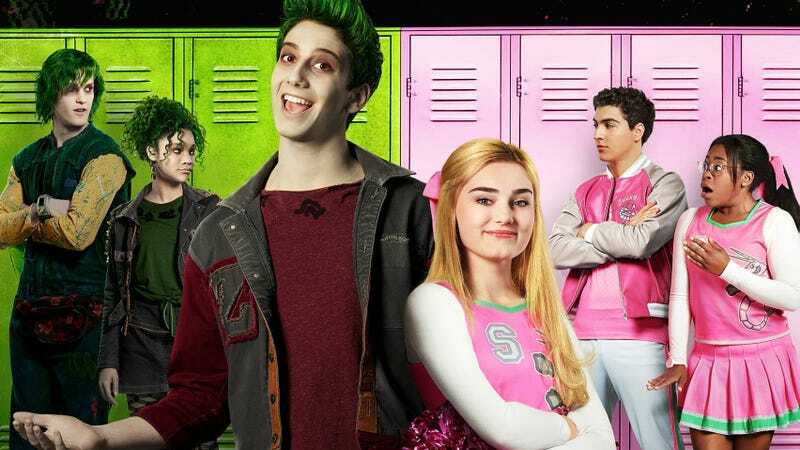 Several teens from Zombietown are transferred to Seabrook High, full of cheerleaders and jocks wearing pastels who so don’t get the zombies’ punk-clad ways. However, thanks to a star-crossed romance—and some other teens who are a bit curious about going to the dark side—the zombies and humans learn to get along. In case this isn’t sounding at all familiar to you, it’s the exact same premise as Descendants. Like, not even trying. I know Disney Channel is known for its cheesy made-for-TV movies, but normally they’re at least a little bit unique. Descendants was dumb, but at least it was original... ish. Zombies is taking the exact same formula, throwing the same coat of paint on it, and seeing if it works all over again. Sadly, it probably will. But you might need copious amounts of alcohol to come out of it alive. Especially after this little earworm burrows its way through your skull. If You&apos;re an Adult Watching Disney&apos;s Descendants, Drink. Heavily.